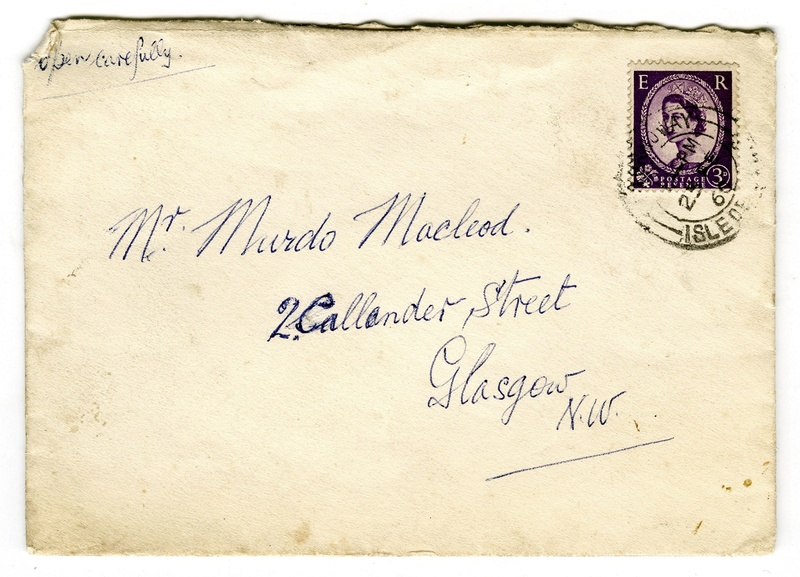 A letter from Dr Macdonald of Gisla and Stornoway to another great Uig historian, Murdo Macleod (Murchadh Chaluim Sheoras, Crowlista and Glasgow). 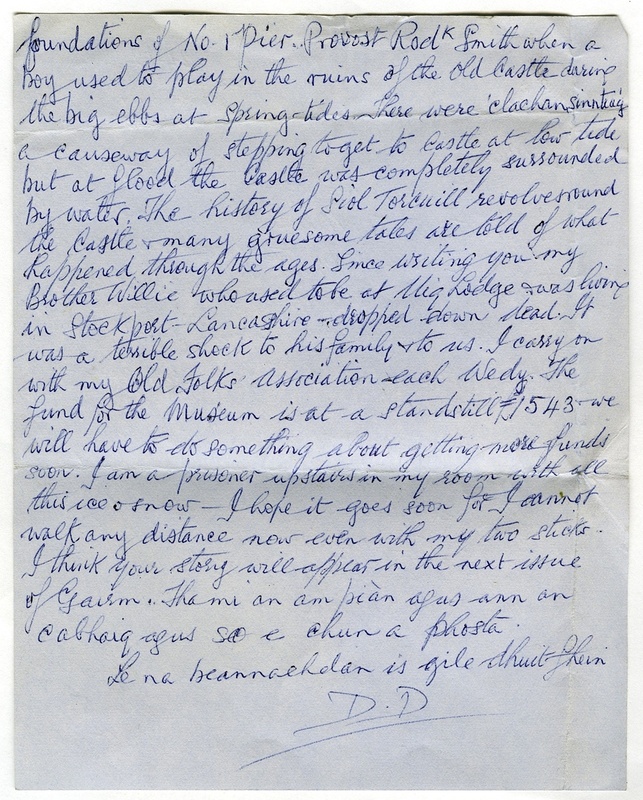 Dolly Doctor was at the time collecting objects and money for a folk museum, which didn’t happen before he died in 1961 but did supply Museum nan Eilean. At last I managed to find the negative of the Castle of the Macleods and have got prints made from it by the people who make my slides. I am sending you one of these prints – you can go into a photographers and get the picture enlarged to any size you fancy but you should ask the price first. You know that Seaforth fortified the castle in support of Charles II about 1962 & in defiance of Cromwell. He sent a company of soldiers from Inverness & they occupied Stornoway & buildt a garrison fort where the Custom House now stands. 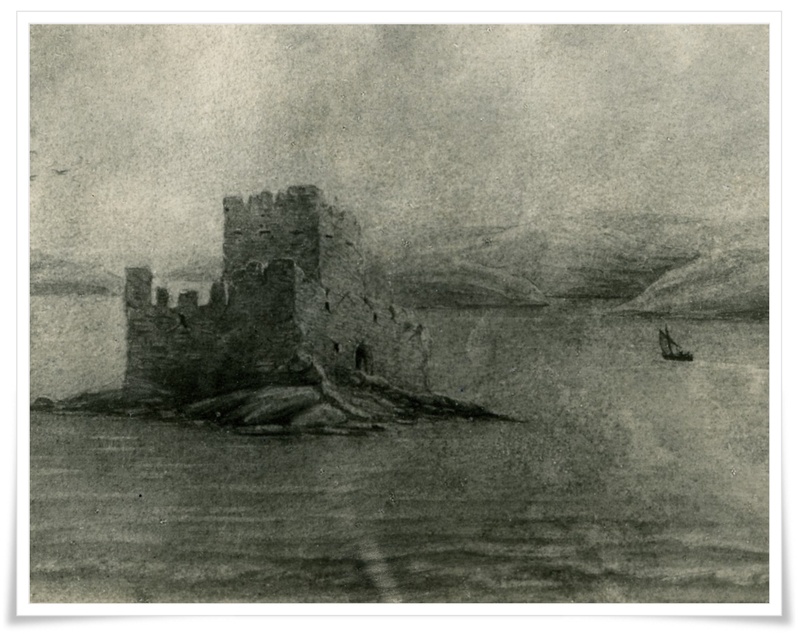 They left the Macleod Castle but in 1654 before leaving to go back to England under Genl Monk they blew up the castle leaving only a part of the walls & the tower. This was its condition up till 1882 when the stones of the tower & old castle were built into the foundations of No. 1 Pier. Provost Rodk Smith when a boy used to play in the ruins of the Old Castle during the big ebbs at spring tides. There were ‘clachan sinnteag’, a causeway of stepping to get to Castle at low tide but at flood the Castle was completely surrounded by water. The history of Siol Torcuill revolves round the Castle & many gruesome tales are told of what happened through the ages. Since writing you my brother Willie who used to be at Uig Lodge & was living in Stockport Lancashire dropped down dead. It was a terrible shock to his family & to us. I carry on with my Old Folks Association each Wedy. 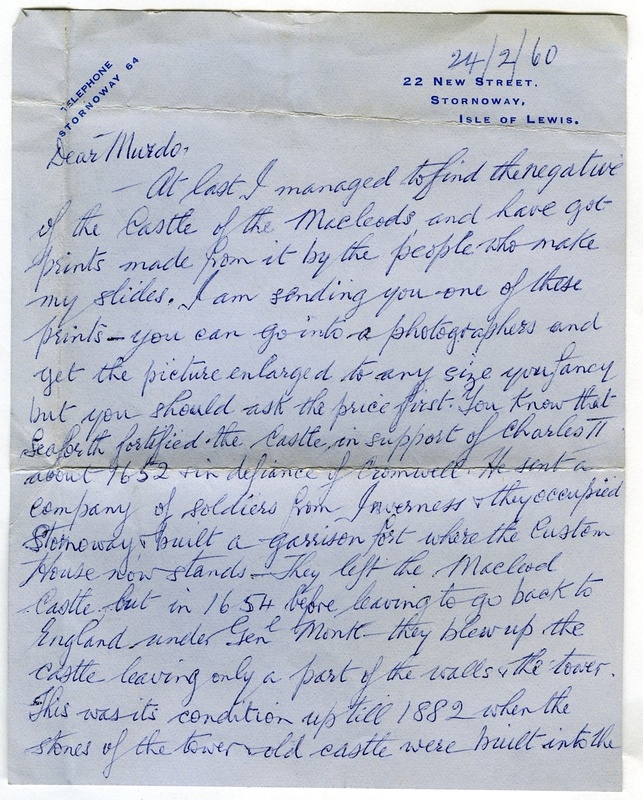 The fund for the Museum is at a standstill £1543 – we will have to do something about getting more funds soon. I am a prisoner upstairs in my room with all this ice & snow. I hope it goes soon for I cannot walk any distance now even with my two sticks. I think your story will appear in the next issue of Gairm. Tha mi an am pian agus ann an cabhaig agus seo e chun a phosta. Le na beannachdan is gile ghuit fhein. Taisg bonn, ‘s cosg bonn, ‘s bidh tu sona; taisg bonn, ‘s na cosg bonn, ‘s bidh tu dona. Save a coin and spend a coin and you’ll be happy; save a coin and spend none, and you’ll be wretched.